It hasn't been a smooth ride for London Mayor Boris Johnson's flagship New Bus for London, or as it has been more recently rebranded the New Routemaster. At the moment there are 700 in service. And putting aesthetics to one side, technically there have been problems and now we can reveal there have been more - this time concerning the power steering. There were reportedly Bikram Yoga levels of heat on the top deck and only recently have Transport for London (TfL) bosses given ground to concerns at City Hall and allowed the installation of opening windows. There were battery failures meaning some of the hybrid buses had to run on diesel and drivers complained the hybrid system was not powerful enough and it had poor acceleration. Now, in another embarrassing revelation, I've been told wiring in the power-assisted steering has had to be replaced in 468 of the buses. It also meant a recall notice being issued by the government's Vehicle and Operator Services Agency (VOSA). It says the recall was as the "power assisted steering may become non-functional". The replacements were carried out by the manufacturer Wrightbus at London garages between October 2015 and February 2016. 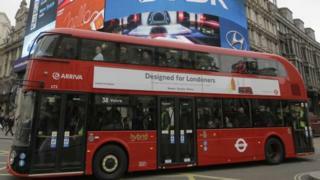 Mike Weston, TfL's director of buses, said: "A fault was found in the electrical wiring of a unit which provides the power assisted steering in one New Routemaster bus in September 2015. "As is standard practice, Wrightbus informed the Driver and Vehicle Standards Agency and, as a precaution, decided to replace the unit on the 468 buses which were manufactured with this component, with the fault found on one further bus. "There was no impact on passenger safety or service, and the precautionary work was completed at no cost to TfL or the taxpayer." Of course - if we are being generous - problems usually arise on new transport projects at the beginning and end of their operational lives. But this latest glitch will play straight into the hands of critics who say the whole New Bus for London scheme is nothing more than a rushed vanity project. And it would have been far more sensible to buy cheaper existing hybrid buses.